Mother’s Day is coming! Less than a month. So that means it’s time. Men, it’s time for you to round up those kiddos and make some effort. Ladies, it’s time to get some paint and glue and make all the handprint crafts you can think of for those grandmothers. I mean, get them a gift if that works for you, but I think homemade things speaks to grandmothers’ hearts. No gift needs to be extravagant and over the top. Something from the heart to share your love and recognize those special mamas is really what it’s all about. It’s easy to find cliche ideas for Mother’s Day. I could come up with a million things that would work for some but not for others. Biggest advice: What’s something that the special mom in your life would love but wouldn’t buy for herself? That’s the winning gift! Now, I’m not saying go buy a car because she wouldn’t do that for herself. Come on, let’s be reasonable! 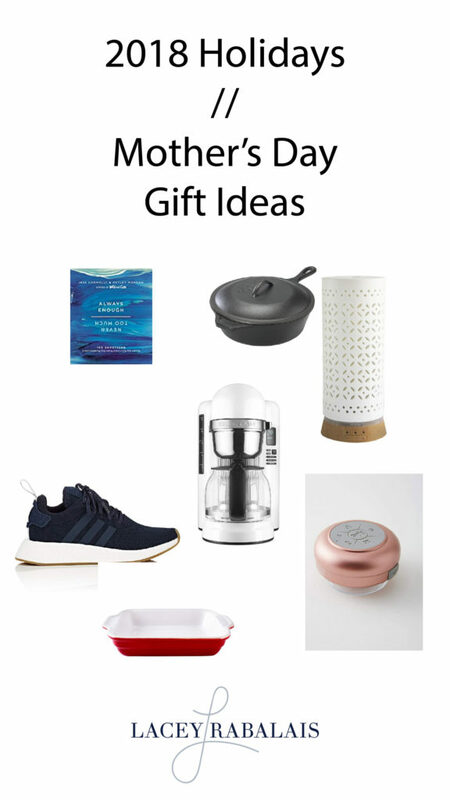 If you can’t come up with any ideas or just need some help, scroll through and see if something might help you find the perfect gift! AFFILIATE LINKS USED. FIND THE FULL DISCLOSURE HERE. IF YOU BUY THROUGH THESE LINKS, KNOW WE’RE THANKFUL AND APPRECIATE IT! Annie Claire Designs // Personalized Jewelry. Perfect for moms! Big and Little Coloring Devotional by Rachel Swanson // This looks like such a sweet thing to do for a mom and child. I think this would also be a great gift for a mom with a preschooler and a newborn. Just intentional easy time together. This book! Always Enough, Never Too Much by Jess Connolly and Hayley Morgan // I cannot say enough good things about this book. It comes out soon and I’m honored to be part of the launch team. But this is a book that every.single.woman needs to have in their hands for each day. There’s devotions for each struggle and moment in life. It’s a flip book and so well done, so full of truth! Very much needed! Personally, I think shopping for grandmothers can be tough. Some people have a grandmother that likes to bake. Others have a grandmother that likes to garden. Some have grandmothers that want to skydive and be adventurous. Whatever your grandmother likes doing, think of a personal gift that she can use and go for it!